DistributionNOW hosted a PESA HR and Emerging Leaders Committees collaborative forum on Talent Management with a focus on Succession Planning, December 14. This roundtable discussion targeted what leadership is doing to best equip the next generation of leaders and how to keep high performers engaged. The forum attendees shared best practices and challenges they face in the current environment. Some of the shared challenges were identifying ways to integrate talent development into business plans, developing employees who may not see the value in growth, and prioritizing succession planning. Best practices around clearly communicating succession plans, talent exporting, and utilizing performance development strategies were deliberated. 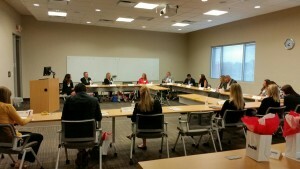 This was a great lead-in discussion for the HR Roundtable next month that will focus on performance development. The roundtable will be January 25 at the Texas A&M Mays Business School in CityCentre, Houston.